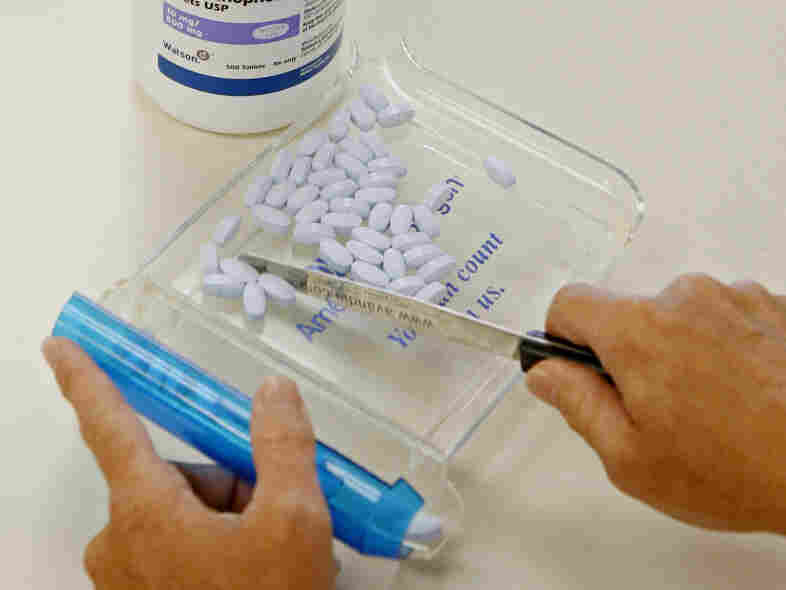 Addiction Risks Weigh On Americans' View Of Painkillers : Shots - Health News Nearly a third of people said they'd questioned or refused a doctor's recommendation of painkillers, according to findings from the latest NPR-Thomson Reuters Health Poll. Fear of addiction and worries about side effects were common concerns. Narcotic painkillers are among the most commonly used drugs in the U.S., with more than 244 million prescriptions dispensed in 2010. The drugs help ease the pain of tens of millions of people each year. But potent narcotics also carry serious risks that can be heightened by chronic use or abuse. So-called pill mills have drawn fire for enabling abuse of such drugs as Oxycontin and Vicodin. And some prominent doctors have called for a re-think of narcotics to treat chronic pain, citing a lack of evidence for that practice and serious problems with misuse. In the latest NPR-Thomson Reuters Health Poll, we asked Americans about their experience with narcotic painkillers and their views about the drugs. Half the respondents said they had been prescribed a narcotic painkiller at least once. More than three-quarters said the drugs are linked to addiction. A little more than a third of respondents who have used they medicines said they had concerns about them. The top issues were side effects (45 percent) and fear of addiction (27 percent). About 30 percent of those who said they hadn't used the painkillers said they had concerns about them. The fear of addiction was the top worry (38 percent) followed by narcotics' association with drug abuse (25 percent). Finally, 31 percent of people polled said they'd questioned or refused a doctor's recommendation of painkillers. Since the discovery of narcotic painkillers, "there's been a swinging pendulum" of opinion about them, said Dr. Gregory Terman, a professor of anesthesiology at the University of Washington School of Medicine. At one extreme people are afraid of the drugs, he told Shots, and at the other people see them as a panacea. "All medications have side effects, and it sound like the people who have used the medication are very aware of the side effects," he said of the poll's findings. Addiction is a legitimate concern, he said, but it's "a side effect that affects a small fraction of people" who have a predisposition for abuse or develop a preference for recreational use of the drugs. He stressed the importance of keeping the "medications in the hands of patients who are doing better" because of them while minimizing the diversion of the drugs for misuse and abuse. The telephone poll was conducted during the first half of October. The margin for error is plus or minus 1.8 percentage points. Click here to read the questions and full results. You can find the previous polls here.